We have two cats. Cleo and Pepette. Or as I like to call them Stupid #1 and Stupid #2. 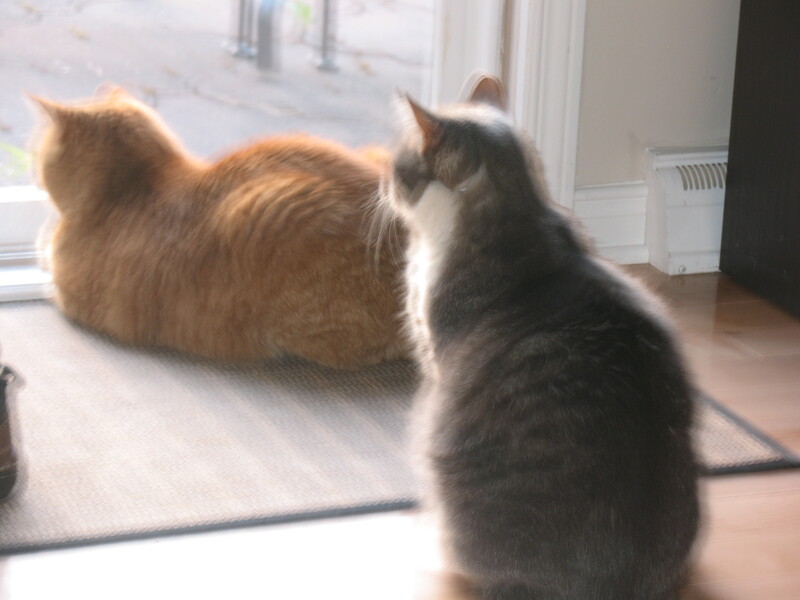 Cleo used to have a brother. Bob. But Bob got hit by a bus. Stupid is as stupid does. We got them as kittens from my stepson's father. I had several names for them. Spin and Marty. Fred and Barney. Bob and Ray. That latter was a tip of the hat to one of the funniest comedy teams I've ever come across. But I digress. Bob and Ray Cleo were the offspring of an incestuous relationship which, so I'm led to believe, happens a lot with cats. Can inbreeding cause stupidity? With Cleo I rest my case. She was born in Rouyn which must be the Ozarks of Quebec because Cleo and brother Bob had a litter of their own. We gave them away. Hey, I said the cats were stupid, not their owners. Pepette was found in an animal shelter by my wife and her son. She's about 150 in people years. In fact she moves like I do...slowly. We often compare notes on our arthritis. Mrs Noname says back in BNN (Before Noname) they called the cat Pepette because she didn't want to holler the first name they gave it when the cat was outside: Fleurette. Oh, yeah, Pepette is so much better! Pepette spends most of the day sleeping. Cleo spends most of the day - wait for it - catting around the neighborhood. With age, Pepette's wasting away. With age Cleo's plumping up. Caution - Not really Cleo, but a reasonable facsimile. Okay, that's not really Cleo. But people who know me and the cats will say "Pretty close!" Is Cleo overweight? Cleo's so fat I took a picture of her and it's still developing. Hence the facsimile. Seriously, Cleo's so fat that she can't reach a couple of spots on her haunches when she's cleaning herself. After awhile she sprouts what looks like wings of dead, dirty hair. 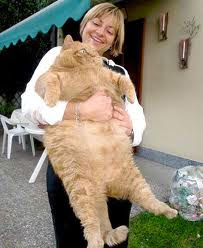 She looks sorta like a fat superhero cat. Or she looks like a thug. She's kind of a cross between Flash Gordon and Coolio. Caution - Another Cleo facsimile. Of course she might be able to fly with those wings, if she weren't so damn fat! How stupid are these cats? Pepette will meow at the patio door to get out. She'll stand on the stoop 10 seconds, sniff the air and meow to get back in. Cleo on the other hand will sit on the stoop gazing wantingly through the patio door waiting to get in. As soon as I hop up to let her in she turns her back and wanders off. These routines repeat themselves every couple of minutes. Cleo and Pepette are probably very intelligent, and are actually conducting elaborate experiments on you, to see how long it will take you to figure out what they want. They're proably calling you and Mrs Noname Stupid #1 and Stupid #2 and laughing at you behind your back. Or not. I could be wrong. Ziva: I take it you like cats, Ziva? My wife takes your view - that they're actually very, very smart. Me? I think they're very, very dumb. They're my stepson's cats and he doesn't even live here anymore. Wait a minute. Who's the stupid one? I'm not a cat person, but you ALMOST make me want one! And now? I'm going to be saying the name Pepette all day long! Actually it reminds me of Lady Gaga's stuttering: pa pa pa pa poker face! Damn! I swear I wrote my post before I read yours. Boy, does that ever look fishy! Stupid is as stupid does alright. Just goes to show you that great minds think alike. Quirks: You want one? I've got two - free! Don: Great minds think alike alright. I gotta tell you, my wife thinks your comments are hilarious, well not as funny as mine of course. She says to tell you "I've gotta meet that guy some day." You've been warned. I guess I'm showing my age when I say that I know who Spin and Marty are. Were. I don't think your cats are *quite* as stupid as you claim. They've got you trained pretty darn good and that takes cunning. Kelly: Yeah, you are. But at least you didn't admit to knowing Bob and Ray. Where on earth is Roun?! I've heard of Rouyn but not Roun...maybe it's a secret town being run by cats plotting the demise of the human race? 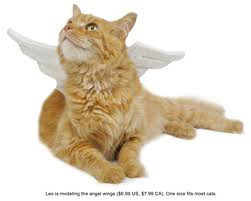 Cat with wings is really beautiful..
Cat Supplies: Yeah, if only she was the real deal. It's clear we have the same cats. Or it is a vast cat conspiracy to drive us insane. Maybe it's the inherited-from-offspring cats? My son gave me his cat when he became a Busy Lawyer and this cat drives me out of my mind. Did you ever hear the story of Jack Benny's widow and her cats? One of them seemed sick. It's pregnant the vet told her. But that is impossible she said, she never goes out. The vet said do you have a male cat. Yes, Mrs. Benny said, but that's her BROTHER! Marie: Yeah, why do the parents get stuck with the pets? That Jack Benny's widow story is a hoot. Cats are pretty strange. Ours are weird, We have two female cats and they hate each other. One always hides around the corner of the wall and when the other cat walks by she jumps out at her. They're absolutely nuts.